What difference does it make if Greece has been found guilty of operating an illegal landfill site in Zakynthos by the Court of Justice of the European Union (CJEU)? Not a lot, it seems. So what if the landfill site in question sits at the edge of the National Marine Park of Zakynthos, almost on top of a beach that is the most vital to the survival of the loggerhead turtle in the whole of the Mediterranean? So what if turtles have already begun coming ashore to dig the season’s first nests? The Greek authorities decided to ignore all this and resume illegally operating the site, which was declared full back in 2006. This development, which flies in the face of the generally acknowledged need for provision to be made for the correct and safe disposal of the island’s waste, enables the continued use of a waste burial site that had supposedly closed and that now represents a danger not only to the environment but also to public health. In response, the European Commission initiated a new pre-hearing enquiry process that may lead to a further judgement against Greece and the imposition of a fine for failure to comply with the previous decision of the CJEU. For the last six months, the piling up of domestic refuse in the streets of the island has been a national embarrassment, preventing local people from going about their daily lives and damaging the local economy. 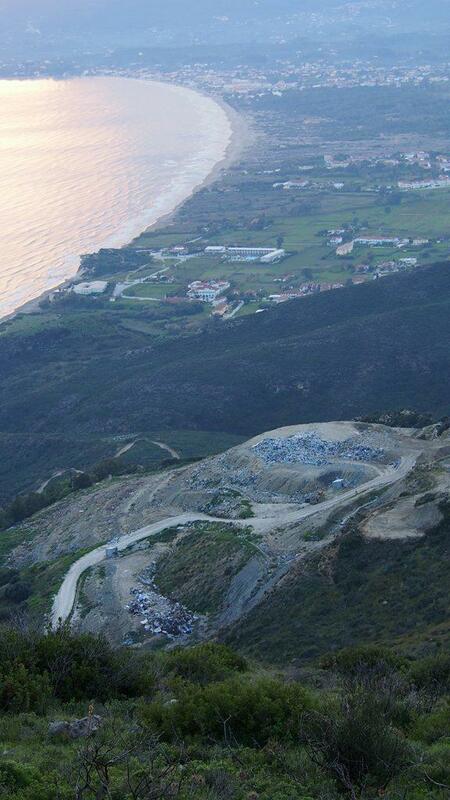 With the first summer visitors having already arrived on the island, the Municipality and responsible authorities have yet to agree to a legal and safe interim solution for the management of the waste in spite of the fact that there are sites with planning permission available. Likewise, there has been an inexcusable delay of many years’ standing in providing a permanent solution to the problem even though there is a suitable site elsewhere that has been approved and declared legal by the Council of State. In contrast, the installation of a new baling machine within the present illegal and over-filled site indicates an intention effectively to resume the transportation of waste into the Protected Zone of the National Marine Park. Meanwhile, the competent authorities provocatively ignore the danger that the waste could collapse, sliding down onto the nesting beaches of Laganas Bay, which are so vital to the sea turtles. It is hard to imagine a more shameful state of affairs for one of the best-known tourist destinations in Greece, and one that moreover is host to a globally recognised habitat for the loggerhead turtle, Caretta caretta. Together with the other environmental NGOs ARCHELON, MOm and WWF Greece, we call upon the competent authorities to take responsibility for the extraordinary damage done to the reputation of Zakynthos and, of course, also for the serious health hazard that residents and visitors alike are being exposed to.